The following article originally appeared in Forbes on Sept. 13, 2018. And if you’re not in sales readiness or corporate learning, you should know that the forgetting curve is not some invention of corporate learning executives. It was actually introduced in 1885 by pioneering German psychologist Hermann Ebbinghaus (who, not surprisingly, also introduced the concept of the “learning curve”). As we can see in diagram 1, the forgetting curve is relatively straightforward: Without reinforcement, the average human will forget roughly half of what they’ve learned within three weeks, and then things continue to decline from there. (This is why we all run for the hills when our kids ask us to help with their math homework.) Subsequent research has found the forgetting curve can be even steeper than that, with 90% of knowledge lost after a week. In the context of sales readiness, sales trainers and managers have sought to combat the forgetting curve and increase knowledge retention by providing reps with ongoing reinforcement exercises. For example, they might put reps through a half-day session on negotiation skills, and then follow up periodically with sales aids and online learning content to reinforce what reps learned. While this approach may seem sensible, it has a glaring weakness: It assumes that the rep has achieved mastery of a competency (e.g., knowledge about a product or skill) in that first learning session — and then places an emphasis on reinforcement, based on that assumption. 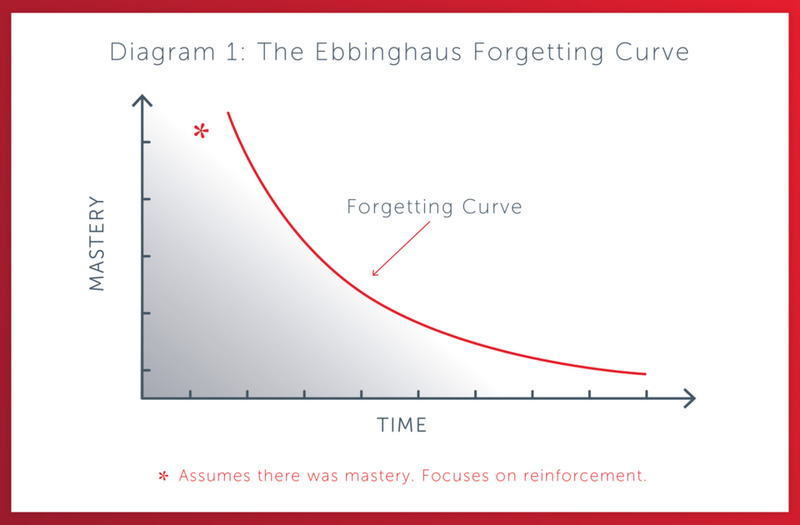 Unfortunately, though, most reps will not be at that 100% line (indicating mastery) on the forgetting curve after one session, making a reinforcement-based strategy the wrong approach. That is, you can’t reinforce something that hasn’t truly been learned yet. In fact, most reps will consciously or subconsciously put up a “learning block” that further distances them from mastery. We all experience this phenomenon — for example, delaying upgrading your mobile phone because you don’t want to go through the effort of learning a new operating system and adapting to new features. The forgetting curve can be a valuable tool once mastery has been achieved. 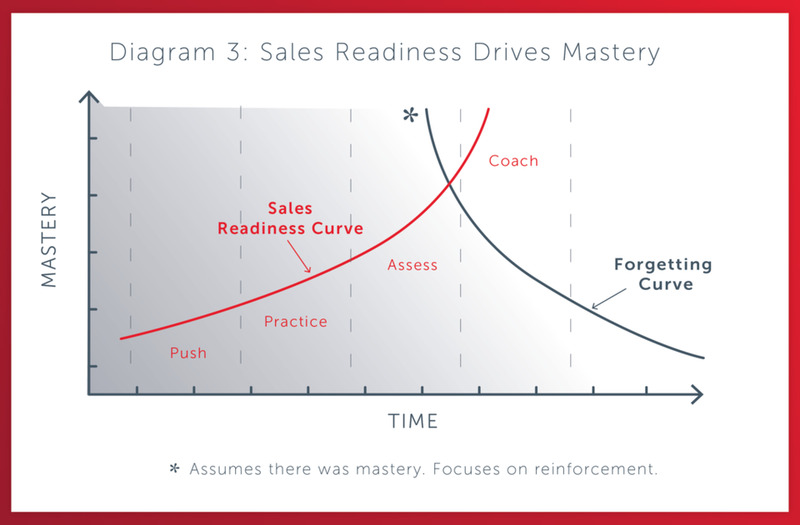 But for sales readiness, there is a better model: the sales readiness curve (see diagram 2), which focuses on mastery first, followed by reinforcement. This push should consist of microlearning content, delivered digitally and proactively to reps through the tools they use every day: smartphones, CRM, email, readiness portal, etc. The learning can be consumed by reps between calls, while traveling — whenever the time is right for them. The goal is to make learning find the rep, rather than relying on the rep to find the learning, and to set expectations that reps will need to demonstrate mastery within a given timeframe. Continuing on the path to readiness, reps should also be enrolled in a series of assessments that must be completed within a specific timeframe. These assessments should initially check for baseline mastery through multiple-choice quizzes. Ultimately, mastery should be tracked and confirmed through video-based assessments and coaching tools. To demonstrate readiness, reps can also live role-play with a manager or sales enablement coach (those coaches should receive detailed assessment guides and scoring criteria from sales enablement leaders). In sales, it’s not enough to know that a rep has consumed learning content; they also must demonstrate that they can deliver the message they need to deliver. It is through this assessment process that reps actually practice the necessary competencies, giving them the opportunity for continuous improvement. Deeming a rep “field-ready” requires in-the-field observation and coaching by a manager or sales enablement coach. For example, a manager should observe an actual interaction between a rep and a buyer, and provide structured feedback and coaching afterward. Managers can also verify readiness by listening to call recordings, watching a recorded web session or even providing feedback on email correspondence between the seller and buyer. These techniques should be codified in a coaching assessment guide, to ensure reps across the field force get consistent coaching and guidance. Once reps prove themselves field-ready by mastering the necessary competencies, it is time to flatten the forgetting curve and prevent memory degradation with reinforcement — which can be delivered through microlearning modules and job aides. The forgetting curve is a useful and proven model, but like any model, it needs to be applied properly. If a rep has not achieved mastery, combatting the forgetting curve isn’t the primary challenge. The primary challenge is getting the rep to master the information in the first place. When it comes to sales learning, it’s time to forget the forgetting curve — as a stand-alone model, that is. 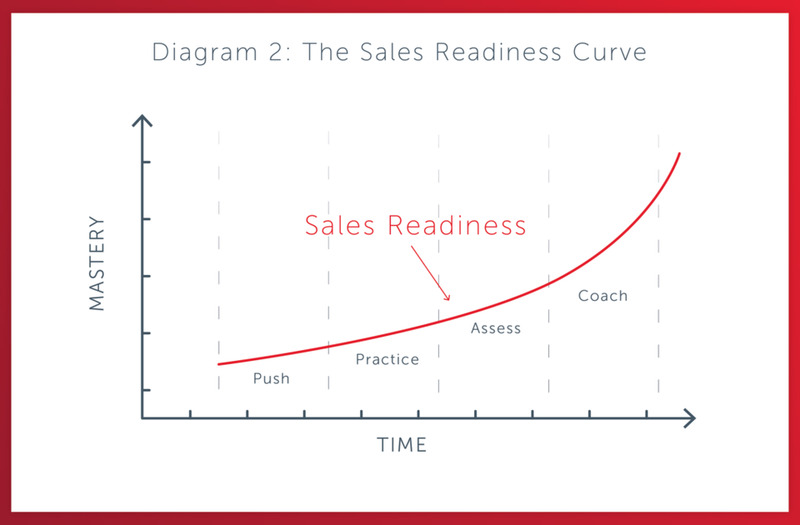 By structuring continuous sales learning programs with the sales readiness curve, in conjunction with the forgetting curve (see diagram 3), sales leaders can ensure that reps will always be ready for the next interaction — and that they’re on the path to true sales mastery.